With the recent and highly publicized poor results on the IIHS small overlap crash test, 2015 is almost certainly the final year for this iteration of the Nissan Quest. Moreover, poor sales numbers (which preceded the IIHS test), and the many failures of the previous generation Quest, may ultimately spell the end of Nissan's presence in the US minivan market. This is a shame, because the current Quest, despite the poor crash test result, is one of the more refined, comfortable, spacious and solidly built minivans on the market. Why the 2014 Nissan Quest? The styling may not be for everyone, but I prefer that it is relatively unique compared to the other minivans on the market. Ironically, the low sales figures for the Quest probably contribute to that. But, I'm also a fan of JDM design, and would probably have prefered if Nissan had directly imported the Elgrand to the US. Nissan made it just a bit too "fat" for the American market, and the JDM fascia is far more attractive in my opinion. The interior is very appealing, with nice materials and design. Overall it feels far more luxurious than the Odyssey, T&C or Sienna, all of which I shopped. Instrument and control design is fine, though some of the center controls are a bit out of reach. Not really bothersome to me. The only drawback I see is that the interior upholstery choices (light grey or beige) are far too light for a family sedan. In fact, the van was delivered to me with 8 miles on the clock, but it already had an assortment of grease stains and marks in the light grey upholstery. With darker upholstery, I would never have noticed. After 3 months with the van, the driver's seat is already stained with dye from my blue jeans. Here's the main reason I bought this van: my kids! Of all the vans we tested, they believed the second and third row seats were the most comfortable. Some may laugh at the boxy shape and fat rear end of the Quest, but the reason it's designed that way is because it maximizes interior room. I'm 6'1" (taller in the torso than legs) and even I think the van is spacious when I sit in the third row. The head and shoulder room is incredible. The seats are all very comfortable. The soft suspension makes riding as a passenger a pleasure. So, despite all the shortcomings I mention in this review, in my opinion, the Quest tops all the competitors in the category of passenger and driver comfort. The pleasing and luxurious interior materials contribute to this. Too bad the production of this iteration of the Quest appears to be in its final chapter. The engine has good power and ample torque to get this 4500 lbs porker up to speed. Keeps up with traffic from a stop or merging onto freeways, and has ample passing power. The VQ engine and the mated exhaust offer a nice throaty growl when accelerating, which I like, but others may not. The CVT it generally smooth, but it does stumble sometimes when coming to a stop. A few times, it's taken me by surprise because it feels like the car lurches right before I come to a complete stop. It's not really an issue, because the van does stop, but the sensation in the pedal as it slows, then shifts and almost glides to a stop is startling. At speed, the shifting is butter smooth (as it should be). When I give it gas, it does "spool" up sometimes and give the impression that instant acceleration is lacking, but it is moving. This is simply a characteristic of the CVT. One thing I have noticed with the CVT is that it will slow the van when the throttle is released. It's odd, because sometimes when I want to allow the van to coast down a long hill, the CVT will slow it to a point where I have to apply throttle to maintain speed down a hill. I wonder if this contributes to worse fuel economy? I was hoping for slightly better fuel economy, but for a 4500 lbs vehicle, I really shouldn't be complaining. In predominantly hilly suburban driving, I'm averaging a couple miles below the estimated city fuel economy number. On 100% hilly highway miles, I'm right about at or maybe 1 mpg above the estimated fuel economy. It would be nice to acheive better highway mpg, but I suppose that's the trade-off for having a torquey engine. You would think the CVT would improve things, and maybe in fact it is helping the poor fuel economy of the aging VQ engine design, but I also think the CVT transmission is a cost-cutting measure by Nissan. It would be nicer to have one of the 7 speed transmissions found in the Infiniti lineup. 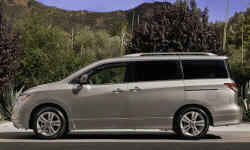 Why Not the 2014 Nissan Quest? While overall the materials and worksmanship appear excellent, there are far more rattles and creaks than I expected. Currently, the third row seats, when in the up position, rub against each other and make an annoying noise. I have the "leatherette" interior, so this may be negligible in cloth upholstered vans. The adjustable seat belt holders also rattle noisily. In cold weather, there are also lots of creaks somewhere between the windshield and cowling. There were only light colored upholstery choices available for the Quest. Would have preferred a darker grey or darker beige in a family, multi-use vehicle. While I appreciate the cushy ride on longer trips, the suspension can be bouncy over bumps and body roll is significant. There's also a fair bit of nose dive during emergency manuevers, but overall the handling is fairly confident. (I should note that I have a model with 16" rims and tires with tall, flexy sidewalls. It's possible the models with 18" rims have more confident handling.) I realize you can't have both worlds, so I chose this van over the others in the market because of the comfortable ride for passengers over long distances. I feel the other vans compromise comfort by attempting to inject "excitement" for the driver by stiffening the suspension and handling, and weighting the steering, all of which result in a choppier, noisier, and more jarring ride over "real world" roads. It just seems silly to attempt with a 2 ton minivan. Could be better, but then the van would have less power. Pick your poison. Given its low sales volume and recent poor crash test results (that IIHS small overlap bombshell came out 1 week after I bought this van to replace a Mazda5, which had equally horrendous results. Can't win for losing! ), this van is likely worth half of what I paid. No matter, I bought a year end model at a deep discount, so I'm okay with it I guess. Gonna have to keep it for the long haul! I did like the titanium color option, but I went with silver because that's what was available in the year end models. Besides, silver, while boring to some, requires the least maintenance (in other words, it hides scratches and dirt better than many other colors). That being said, it would be nice if car manufacturers would use a wider color palette. I suppose we're still in a recession, so conservative colors are the preference.